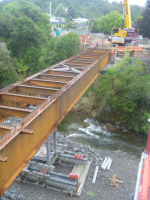 The site team have reached a significant milestone by successfully installing the 42m long, 33 tonne steel bridge girders. A 350t mobile crane with full counterweight was at 98% capacity for the 26m lifting radius. A crane pad was designed and built for the crane's front outrigger load of 120t which was positioned not far from the edge of an 8m bank. The pad performed perfectly thanks to the BPC HQ Geotech team, as well as the site team who worked hard to have it built in time. Over the last month the team have done a great job to complete the steelwork assembly, land the precast deck panels and have the in situ deck poured. On the home straight now, over the next month the bridge barriers will be put in place, pouring the stitch and approach slabs and then finishing off with some services and paving.